What elements contributed to the success of this catalytic project? The East Gateway neighborhood, located one mile east of Clearwater, Florida’s downtown core, has experienced years of disinvestment. Like many disadvantaged neighborhoods, it is an area with pockets of poorly maintained properties. The majority of the housing is rental properties (74% of units), and much of the remaining property is underutilized and obsolete strip commercial. Located in the target area of Clearwater’s Community Redevelopment Agency (CRA), there are active plans to stabilize and revitalize the area. The City of Clearwater and CRA were looking for partners to encourage investment in the area. However, maintaining momentum with the neighborhood during one of the worst recessions was incredibly difficult. Focusing investment and attention on one catalytic project became vital. Choosing a project that meets multiple goals and objectives and addresses a critical need is important. Increasing homeownership and stabilizing the area was a key objective for the community. The City also wanted to increase incomes in an area of concentrated rental property, encourage reinvestment, and increase property values. Finding locations for homeownership opportunities in a built-out area was tricky, but the City encouraged the developer to look at the target area with few vacant lots for opportunities. The developer approached the owner of a large commercial property, with an underutilized parking lot and overgrown landscaping, and requested that the owner sub-divide the lot and sell 3.3 acres. The site, located across the street from a golf course, was a great location for workforce housing. Though complicated, subdividing the parcels created a new opportunity for infill development. In looking for elements to make the project as successful as possible, the development was revamped to include 13 market-rate units, as opposed to a 100% affordable project, as originally envisioned. This made the project more financially and socially viable. All of the 31 units are highly marketable, three-bedroom, two and a half-bath, two-car garage homes that have the same look and feel, with slight variations in square footage ranging from 1,300 to 1,436. Residents share all of the same amenities including a community pavilion with a pool, a playground and energy-efficient features, such as low-energy appliances, metal roofs, energy-efficient windows and water heaters. Development of this mixed-income, for-sale community was by Southport Financial, a national developer of affordable and market-rate (mostly multi-family) units with roots in Clearwater. Experience became the critical factor for this community, as the developer was able to work collaboratively with the City to find creative solutions to keep the project alive during the recession. 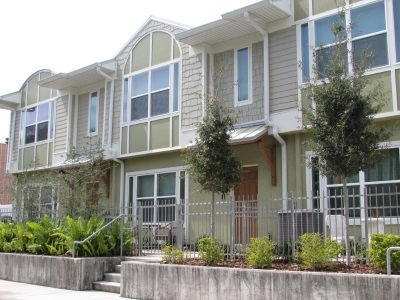 In addition, the City partnered with the non-profit Tampa Bay Community Development Corporation to qualify the income eligible buyers for the affordable units. Communication became crucial as additional partners were needed, including the County and then a funding consortium. All the partners had to work together to bring about project success. As explained later in this article, the financing became a critical component to the success of this project, including multiple sources of funding. Today’s affordable housing projects require many layers of financing, but don’t be afraid to look for as many as you need. For example, to make this project a reality the City joined a consortium through Pinellas County to access Neighborhood Stabilization Program 2 (NSP2) funding, and identified Country Club Townhomes as one of its priority projects. It took time and many agreements between all the partners and the developer to be able to define a structure for the funding and partnerships. As the project became increasingly complex with multiple mortgages and loans on the property, and additional layers of financing needed (an NSP3 loan in addition to an NSP2 loan), the City requested technical assistance from HUD to be able to meet its commitment deadlines for the federal programs. Understanding that help was needed and asking for it was a critical aspect of making a successful project. The City worked with a small team of consultants led by Doug Harsany of Harsany and Associates, LLC. The team, working under The Cloudburst Group, also included Julia Pierson, Chris Plummer, and Sage Hales-Ho. A first loan was needed to acquire the property, and a second loan to construct the infrastructure. Both of these loans were more “patient” as to repayment terms. To make the project work, a third loan was needed for construction financing, and its payments had to take precedence over the first two loans. Doug created a loan administration agreement to detail all the lenders and their order of priority. This was needed on a 2nd construction loan as well as other agreements between all the partners. In order to overcome the affordability sales gap, i.e. the difference between the sales price of the house and what the buyer could afford, the City amended its Down Payment and Closing Cost Assistance Policy to increase the subsidy needed by the homebuyer to purchase the home (up to $45,000). In addition, the City increased the timeframe for development to allow the developer to take advantage of the 0% interest on the acquisition loan. The City also overcame initial concern and pushback from the community due to the perception of “affordable” housing. Through continuous engagement with the East Gateway Stakeholder Advisory Group and the East Gateway Business and Neighbors Association, the positive benefits of the project were thoroughly explained and the groups ended up supporting the project. The developer marketed this project just like a new, for-sale product, working with real estate brokers. The City used its media connections to showcase the project on a local television station and to other government and hospital locations. The marketing helped to improve the perception of the area as an urban neighborhood with workforce housing. The City/CRA began exploring options with the developer for this project in 2007. The project was completed in 2014, with 100% sales occurring by the end of 2015. The ability to stay on course, and have strong faith in the value of this project, by both the City/CRA and the Developer, was critical to its success. Ultimately, the long-term value provided to the neighborhood outweighed the time and effort invested. How did the financing work? In 2008, the City provided the developer a loan of $700,000 from Community Development Block Grant (CDBG) to acquire the property. At the time, it was envisioned that the sales prices of the homes would be able to cover the construction costs, while the City’s Housing Down Payment and Closing Cost Assistance Program would assist the homebuyers. With the downturn in the housing market, the project was not feasible as originally envisioned, and the City/CRA staff needed to be creative in identifying funding sources and layering financing to make the project a reality. In 2011, the City joined the Florida Suncoast Housing Partners, an NSP 2 consortium made up of Neighborhood Lending Partners, Pinellas County (with the City of Clearwater), and Pasco County. The City made a $1,576,800 loan to the developer for the infrastructure, site work, and construction of the first 5 townhome units. An innovative concept was to use the proceeds from the sale of the first 5 townhome units to fund the construction of the next set of units, as a revolving construction line of credit. By 2012, the infrastructure was completed and the first 5 townhomes were built. However, the area was still feeling the effects of the housing recession and the townhomes were not selling. Given all the investment that was already in the project, the City and the developer had to work together to make sure the project did not fail. The City decided to use its NSP3 allocation and provide a second construction loan of $475,770 to the developer. This was to speed up construction and get an additional 4 units built, allowing for a variety of unit choices to be available for sale, specifically units located off of a busy road. The infusion of NSP3 funds was critical to jumpstart the project and get sales actively underway. To keep momentum going, the developer funded the gap needed to allow for the construction line of credit to kick in before there were enough units sold to fund the next set of units. By the end of 2014, construction of all units was completed, and all units were sold by the end of 2015. We were able to meet all program commitment and expenditure deadlines. What has been the impact on the community? The townhomes sold for an average of $150,000 (subsidized) for the affordable units and $165,000 for the market-rate units, improving area property values. The diversity of homeownership in this townhome community has helped to stabilize the area and brought pride of ownership. The development has prompted many area homeowners to paint their homes, improve their landscaping, and repair their roofs. The project also provided impetus and justification to the CRA to purchase two dilapidated motels and a restaurant one block away that had multiple police calls for service. All buildings on the site were demolished to prepare the site for redevelopment. A community garden was built on a portion of the site as an interim use, which is acting as an amenity available to neighborhood residents. What are the lessons learned applicable for my community? The elements of this collaborative project can be duplicated and achieved through experienced development partners, creative financing, and strong collaboration and buy-in from government and community partners, even if you don’t have access to some of the programs utilized here. ⦁ Work with an experienced developer with a profound commitment to the community. It was the developer’s commitment to the project and improving the area that enabled the completion of Country Club Townhomes, as they were able to creatively and patiently address the obstacles encountered. ⦁ Use your relationships to explore public-private partnerships. It was the CRA/City staff’s existing relationships with the developer and lenders that made the creative partnerships and financing possible. ⦁ Coordinate and communicate with city departments to be able to quickly address issues as they arise. Immediate intervention on issues of storm water runoff from a state road, storm water pond issues, utility poles that serviced the previous site, and permitting helped keep the project on track. ⦁ Be flexible and open to adapting programs to adjust to market conditions. ⦁ Prepare advertising and marketing materials as if the project was a market-rate planned development community. The developer designed and outfitted a model unit so homebuyers had a sense of how furniture would fit into the spacious units. This was a critical step to selling the units. ⦁ Establish partnerships early in the process with realtors, brokers, and most importantly lenders that understand the affordable housing components/funding of the project. ⦁ Use the media to your advantage. The partners took every opportunity to showcase the project to promote sales, including writing press releases, attending homebuyer workshops, and pitching the story to local news and cable outlets. ⦁ Have patience, but stand your ground. Ultimately, you know what is a good project for your community, so have the patience and the drive to continue to fight for those things that will make your community better, as it will have value in the end. ⦁ Most importantly, remember to have fun doing it! I came across your webpage quite by accident. And I’m glad I did. I was searching for images, articles and photos of the history of Country Club Townhomes. I am creating a secure members-only-website for Country Club Townhomes of Clearwater. The HOA has a presence on Facebook but only 8-9 units regularly log into this public social media. The Board, and some unit owners, saw a need for a secure website to foster communication among the 31 owners. It will be a portal to include a secure place for the Association’s documents, Owners’ Directory, Board Minutes and Announcements, Annual Budget, News, Calendar, Photo Gallery and Management Company. I would like your permission to include this article on our website. If you have more stories and photos of the development, I would enjoy seeing them also for inclusion on our website. Just wanted to thank you and let you know that we are doing well because of your efforts. Thank you so much for your email and your kind words. It is great to hear about the vibrant community that is evolving around this project, and always good to hear about the difference that our work has made. You are certainly welcome to use this article on your website.